This cake was a learning experience. I started with a vision of the perfect fall cake. I wanted pumpkin, preferably flavored with ginger and molasses. I wanted caramel, preferably with the deep flavor of browned butter and just a touch salty. And I wanted chocolate. I scoured my cookbooks. Nothing. I scoured the internet. Nothing. I settled on a recipe for pumpkin cake with oat flour and set about making the necessary alterations. 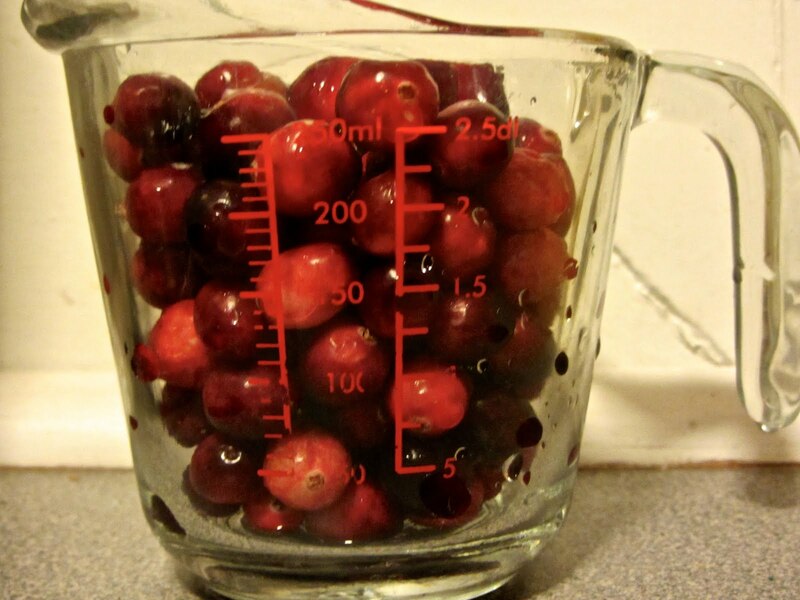 I chopped the sugar volume by a third and altered the spice ratios. Then I got distracted. I aimlessly scrolled down the page, and when I returned to the recipe, I was a few ingredients further along than I should have been. 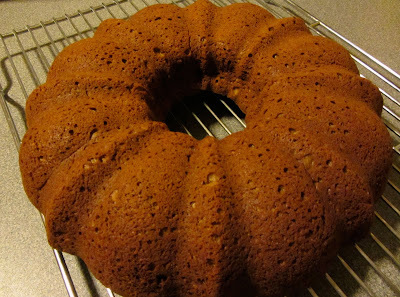 It wasn't until I poured the batter into the bundt pan and thought to myself, gosh, how strange that this cake didn't have either baking soda or baking powder, that I realized my mistake. I scraped the batter out of the pan back into the mix bowl, and whisked in the missing ingredients. Honestly, I'm not sure it made a difference. The cake was fairly flat, but so was the second one. That was mistake one. I made mistake two with the caramel. Having already rejected the thin liquid caramel glaze the recipe called for in favor of a thicker spread, I got impatient (I was running late for an impromptu early thanksgiving potluck) and neglected to sift the powdered sugar. As you can see from the picture, the result was that my caramel was speckled with sugar pockets. Not bad to eat, but not great to look at either. That was my second mistake. My third mistake is more subjective. As anyone who knows me will tell you, I am a huge chocolate fan. Almost every dessert I propose either has a chocolate bake or ends with, and then I'll drizzle on some melted chocolate. Any kind of ice cream or sorbet, add the chocolate. Ginger pudding? Add the chocolate. Gingerbread: douse it with chocolate. I took that approach here. I melted about 6 ounces of dark chocolate (70%) add a few tablespoons of butter and seriously doused the cake with it. Now, this liquid chocolate was delicious. And the cake tasted pretty great with it. There was one serious problem. The chocolate killed the caramel. I started over the next day (having promised to bring in a cake to my office, as some of my coworkers had recently chipped in to a cake carrier replacement fund when my first cake carrier was stolen from office, thereby preventing me from bringing any more cake to the office). 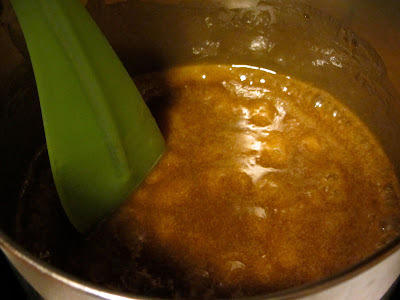 I added the baking soda and powder at the right time (no difference in height); I sifted the powdered sugar (nice smooth glaze, sorry I forgot to take any pictures of it), and, instead of the extra layer of chocolate, I melted a handful of dark chocolate (about an ounce) into the caramel. Perfect! 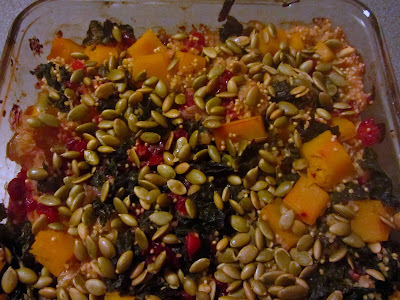 Because of the oats and the pumpkin, the cake itself is fairly hearty. Almost savory. The caramel is anything but. Next time I make it I might try it as the original recipe recommends, with a thin caramel glaze and candied pumpkin seed topping, which sounds delicious, but just wasn't what I was in the mood for this weekend. 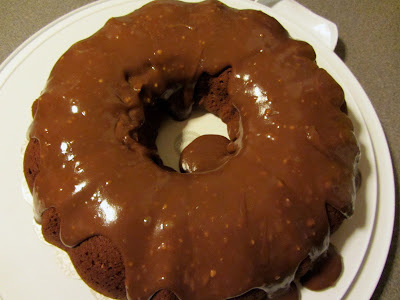 Or you could skip the caramel and serve this cake for breakfast. I bet it would be delicious dunked into hot chocolate! Sweetness factor: 9 (frosting); 4 (cake); indulgence factor: 9 (frosting); 4 (cake); difficulty factor: 4; chance I'll make it again: 10. Preheat the oven to 350. Thoroughly butter bundt pan. Grind the oats in a food processor until they're as fine as you think they'll go. Add the flour and other dry ingredients and pulse to mix. In a large mixing bowl, lightly whisk the eggs. Add the pumpkin, freshly grated ginger, oil, molasses, brown sugar, and vanilla. Note: if you use the same measuring cup for the oil and molasses and measure the oil first, the molasses should glide right out of the cup with none left behind. Whisk to combine. Slowly add the flour mix and whisk until well-combined. 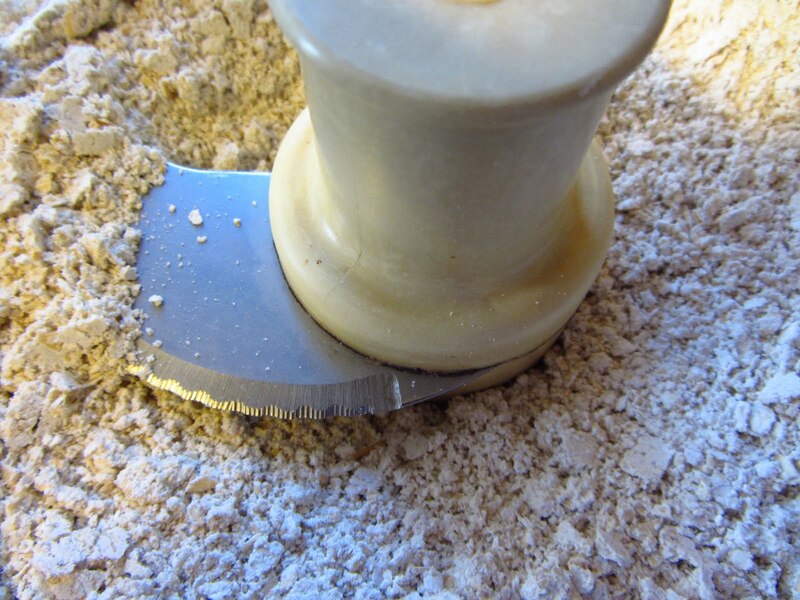 You'll now be able to see any of the large bits of oat that didn't grind down. Don't worry about these. Let the batter sit about ten minutes (so those bits of oat get saturated). Pour into the prepared pan and bake about 35 minutes, until the tester comes out clean and the cake has started to pull away from the sides. Let cool in pan five minutes, then invert onto a rack and let cool completely. Melt the butter in a small, heavy-bottomed saucepan over medium heat. Let the butter simmer for 4-5 minutes until it starts to brown and smell a but nutty. Add the brown sugar and salt. Stir to dissolve. Add the cream. Stir frequently. Let mixture come to a bowl, and bowl for one minute. Remove from heat. Add the chocolate. Stir to ensure the chocolate melts completely. Slowly add the powdered sugar until the mixture reaches a thick consistency (thin enough to poor, but not so thin it will all fall of the cake). Pour onto cake. Let set before transporting. I have been feeling uninspired in the kitchen this summer. Recently, I realized it was because for several months I had strayed away from my dinner mainstay: the caramelized onion. A miracle of modern cooking that, in my personal opinion, makes most savory foods better. They are sweet, but hardy, and stand up well to a variety of flavor combinations and to the addition of spice. Needing to throw together a weeknight meal for some last-minute dinner guests, I turned to the caramelized onion (well, not quite caramelized, but well-sauteed) to add some depth to gazpacho that I would be making with, gasp, canned tomatoes. Turns out, actually, that any snobbery I had about the canned tomato was misplaced. They make an excellent gazpacho, particularly when you don't have enough time to really let the soup sit. With the onions, the soup had a surprising depth of flavor. The saute is also a good short cut. Usually the acidity in the tomato sauce helps break down whatever it is about onions and garlic that is hard to eat raw (how's this for some hack kitchen science--I'm making it up as a I go along). 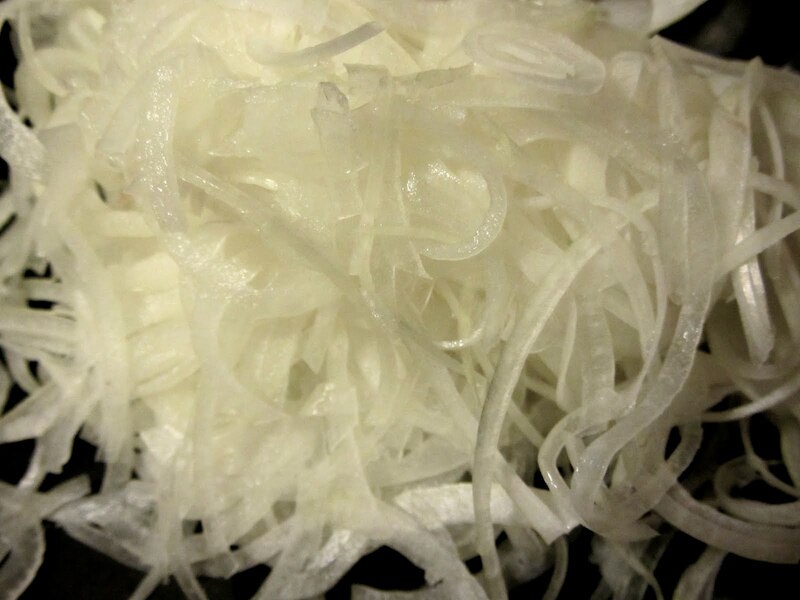 Without the raw onions, the soup doesn't need to sit for several hours before serving. I served it on top of a hefty scoop of quinoa, which made the meal complete, and added an extra nuttiness to the soup. It also obviated the need for bread--the loaf I ran out for at the last minute for languished in the corner of the table almost untouched. Gazpacho is perfect in this I-couldn't-possibly-stand-over-a-hot-stove kind of weather (of course, I did anyway for the onions and the quinoa, but what's a little sweat for a delicious meal!). This is also one of those dishes that is endlessly customizable. You can use whatever veggies you have in the house. I happened to have radishes and an excess of scallions and cucumbers. But you could also use peppers or zucchini (roasted might be nice). Or all of the above. Sweetness Factor: 3; Difficulty Factor: 1; Indulgence Factor: 2; Chance I'll make it Again: 10. Put the onion and garlic in a large sauce pan on low heat. Cover and let cook until the onions start to wilt. Add the oil. Cook, on low, stirring occasionally, another twenty minutes or so, until the onions are as soft as you want them. Combine all the ingredients in a large bowl. Stir. At this point, you could puree some or all of the soup, depending on your preference. Chill until cold. About an hour. The longer it sits the better it will taste, but an hour is definitely sufficient for this soup. 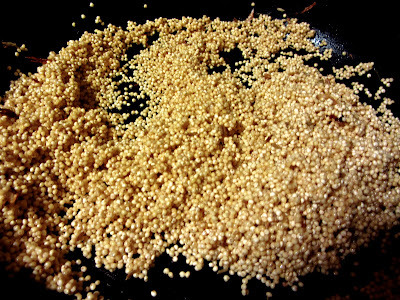 Serve over quinoa, if this is the main course, or with a slice of bread, if this is an appetizer. Garnish, if desired, with chopped parsley. I guess you can't really call yourself a food blogger if you don't gush, at least once, about how excited you are about the farmers' market in spring and the delights of that versatile early spring vegetable whose subtle flavor just isn't quite so good at any other time of year. Of course, I'm talking about asparagus. To be sure, it is basically available year round, but it is best now, recently picked, from a farm within a state or two of here. Is that just some local food brouhaha? Not with asparagus (disclaimer: I haven't actually done a side-by-side taste test, but I'm pretty sure this is true). When you are at the farmers' market this weekend and you are appalled to find that enough asparagus for a meal for four costs six dollars, take a deep breath, hand over the money, and cover the cost by having one fewer drinks at happy hour or by packing a peanut butter and jelly sandwich for lunch instead of heading out to chop't (or cosi or whatever other establishment was going to make you 10 dollar lunch tomorrow). It is worth it! There are a lot of delicious ways to prepare asparagus and I like them all. Except for the ones that involve excessive boiling. Over boiled asparagus is disgusting. It smells foul. It looks sad and limp, and you will definitely have wasted your six dollars. Also, I don't like it in any kind of creamy sauce. Cream drags it down! I came across this recipe while looking for a quick weeknight meal. It lets the asparagus shine by pairing it with a pair of other contrasting flavors: the sweet balsamic and the salty parmesan. And the recipe was true to its promise of quick. Everything can be done within the time it takes to get a pot of water boiling and cook the penne. Speaking of which, I suppose you could use a different shape of pasta, but I really like the parallelism between the penne and the asparagus. I almost bought rigatoni instead, but I thought better of it when it occurred to me that the short slices of asparagus might get lost inside the rigatoni and would miss out on a proper coating of balsamic. The parmesan is a fairly critical ingredient. You've already made the investment in the asparagus, so don't cheap out on some crappy parmesan! Either a parmegiano reggiano or a pecorino romano (preferably one you grate yourself) will do. You might have to skip two drinks or pack lunch twice to cover this. But it is so worth it! And one large block will last you a while (it keeps for a very long time). Speaking of parmesan, I went for the first time to the Brazilian steak house, Fogo de Chao (which is incredible, if you are up for an onslaught of meat--this restaurant is a bit how I imagined meals unfolding in the capital city of Panem), and at the salad bar they had an entire wheel of parmesan (look for it in this slide show of salad bar images). If you like parmesan and have never had the experience of digging a fork into a whole parmesan wheel and scraping out as much cheese as you'd like, then I highly recommend making yourself a reservation right now. Back to my light weeknight dinner. I served the penne with a small caprese salad, with small spheres of mozarella quartered, a chopped tomato, and chopped basil. I tossed them in the bowl I used to prepare the asparagus, which had plenty of oil left coating the sides that no more was required. I did add more salt and pepper. A plain green salad would have been good as well. Sweetness Factor: 4; Indulgence Factor: 4; Difficulty Factor: 2; Chance I'll Make it Again: 10. Put up water to boil for the pasta. Preheat the oven to 350. Prepare the asparagus by careful rinsing it and snapping off the tough part of the ends (usually about 1-2 inches). Chop it into 1-2 inch sections. Toss in a bowl with salt and pepper and a table spoon or two of olive oil (enough to for a thin coat). Spread the asparagus out on a baking sheet and bake for about 15 minutes, until the asparagus is cooked through and has started to whither a bit. Once the water boils and the pasta is cooking, start the balsamic. Put it in a small saucepan on medium heat and let it simmer for 5-10 minutes (depending on how hot your stove is, mine is electric, so everything takes longer). 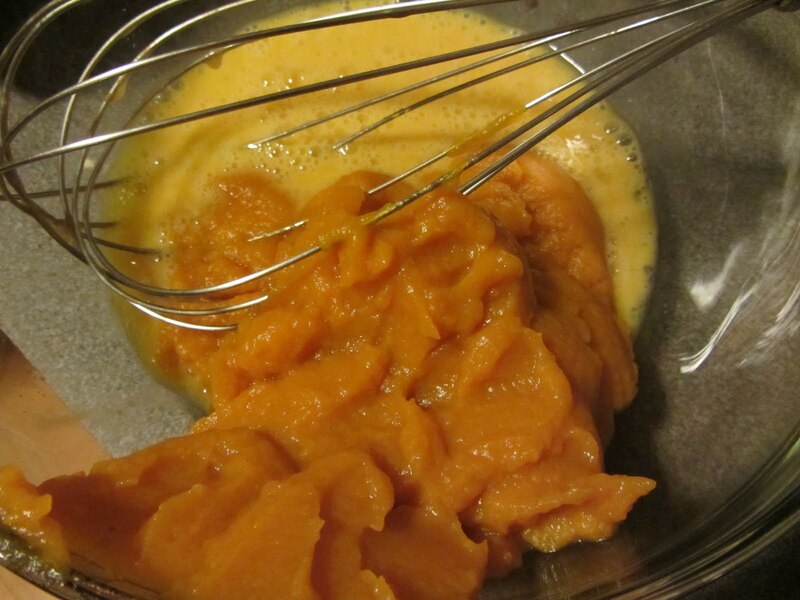 Once it has reduced in volume by about two thirds add the sugar, whisk to combine, and cook it down a bit more. Add a dash of salt and few grindings of pepper. Drain the penne. Combine it in a large bowl with the asparagus and balsamic. Toss to thoroughly combine. I prefer to bring the cheese and a grater to the table and let everyone serve themselves, but you could also grate the cheese directly into the serving bowl and stir it in. Note: If you have leftovers, this is pretty cold on day two. I heart sandwiches. In my house growing up, my dad was in charge of sandwiches. At lunch time on a weekend, my sister and I would wait for my dad to come home from his studio and announce it was lunch time. Then we would gather around in the kitchen and eagerly await the sandwiches he would set in front of us. They were variations on a theme: sliced turkey and cheese, often gruyere or goat gouda, on a toasted bagel with some combination of dijon mustard, spicy peppers, hummus, watercress, and tomato from the garden. Often, the sandwiches would contain evidence of last night's dinner: a slice of steak or a sliver of grilled chicken. On a weekends home from college, despite having slept in and had breakfast only just before my dad's lunch hour, I would always raise my hand when my dad asked who else wanted a sandwich. Now on visits home, nothing has changed. My dad's sandwiches are legendary. But I live pretty far from home. I am working on my own sandwich making skills. There are two types of sandwiches. Throw together sandwiches: which incorporate things requiring no preparation (sliced meat, tomatoes, condiments, leftovers etc.). And project sandwiches: for which you cook things. This past weekend, I stumbled on a project sandwich that was worth writing home about. I had a large bag of kale that needed rescuing and a moment of inspiration. I set to work on caramelizing an onion (an important first step to any project sandwich). The original plan was: balsamic vinaigrette, caramelized onions, crispy kale chips, and sliced hard boiled eggs, but before the water came to a boil I realized that a fried egg would be a much better way to go. I made the sandwiches with cheddar, but as my audience pointed out, mozzarella would be amazing. I served them with a side of spicy sweet potato oven fries. 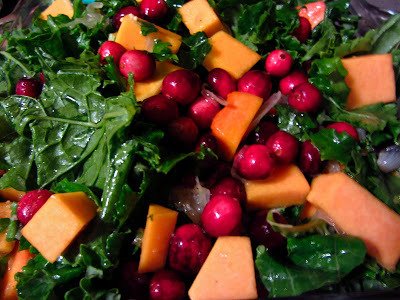 But they would also make a full dinner with a bit of salad or any other veggie. I have had these twice already, and will probably have them again this weekend. I will also be doing some grilled cheese sandwich experimentation in the next few weeks in order to enter this competition. (That's right, it is a grilled cheese academy!!). Sweetness Factor: 2; Indulgence Factor: 6; Difficulty Factor: 5; Chance I'll Make Them Again: 10. Thinly slice the onion. Put over low to medium heat with lid on until onions begin to wilt. Add a tablespoon olive oil, turn the heat down to low, put the lid back on. Stir occasionally. Cook for about 1 hour until soft and mushy. Preheat the oven to 400. Scrub the potatoes. Slice them into 1/4 to 1/2 inch spears. Grind up the spices. Toss the spears with the olive oil and spices. Spread out on a baking sheet. Bake for about 35 minutes, stirring once about half way through, until the potatoes are easily pierced with a fork and are starting to brown a bit. For the kale, when the potatoes are done turn the oven temperature down to 350. Carefully rinse the kale. Remove the leaves from the stems. The stems are no good in this meal, but save them because they are excellent in a stir fry or in a lentil stew. Rip the kale up into smallish pieces. 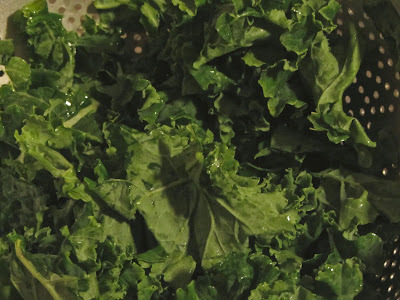 Toss the kale with the olive oil and salt and pepper. Spread it out on a baking sheet and put in the oven. Make sure the kale is spread thinly enough (there shouldn't be too many pieces stacked on top of each other) or the kale won't cook evenly. Bake until the kale is crispy and beginning to brown. For the dressing, combine the liquid ingredients and the mustard in a jar and give it a good shake. Peel the garlic and press against the cutting board with the side of your knife. Add the cloves whole. Salt and pepper to taste. 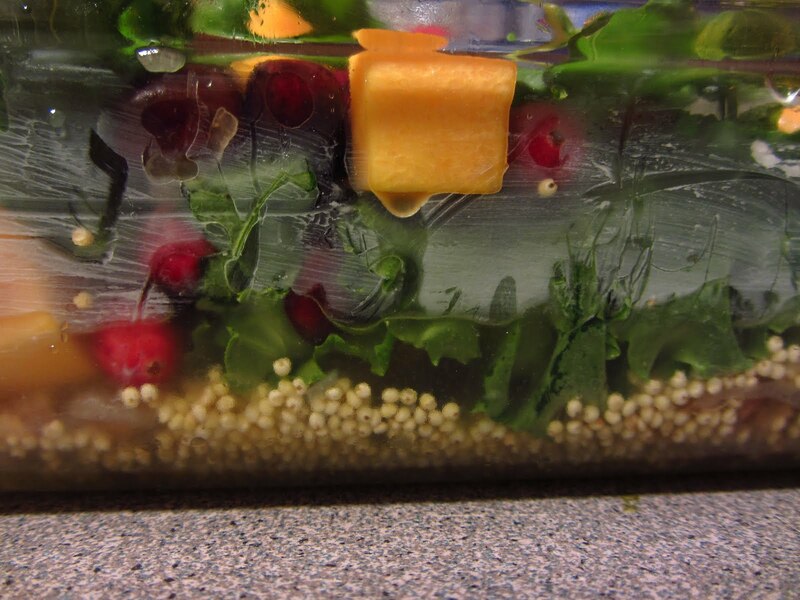 Taste the dressing and alter the vinegar/ oil ratio to suit your taste. Fry the eggs. Toast the bread (I have a toaster oven, so I put the cheese on before putting the bread in the toaster). Drizzle one side of the bread with the vinaigrette. Smear on onions, sprinkle on kale, add the cooked egg. Eat!